Wal-mart camping pad is awesome. 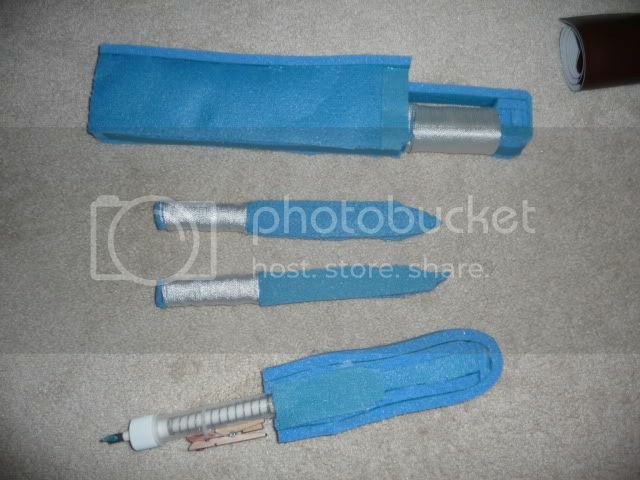 Assorted melee weapons, throwing-safe, the hardest material on the outside is rope. The last one is a modded resin pump. Hits 50+ feet. I like it. Travel Cost to TRU = $2. Eliminator pack = $15. Momentum testing = 2 lost darts. Outranging Recons with your mini pistol = priceless. Edited by rego, 31 October 2011 - 06:39 AM. I promised NerfOMania That I would post pictures here, so here they are! 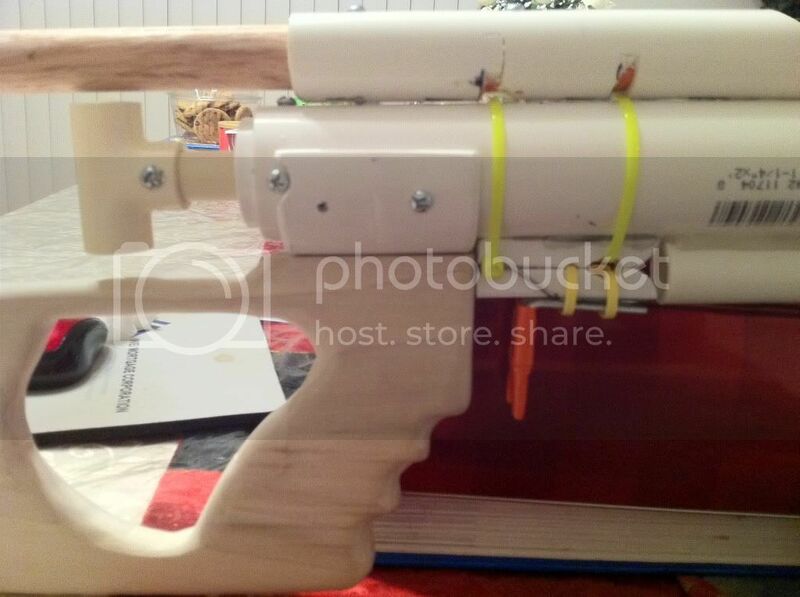 This is a Custom Pumpsnap 2.0 made by NerfOMania. Name written in Paint towards the front. Custom Laminated Sticker on the back. I put that one on. Overall, one of the most beautiful, functional, and fun blasters that have ever passed through my hands. I'm definitely keeping this for a long, long time. I couldn't recommend NerfOMania's work more. I'd actually finished this a while ago, and someone bought it. 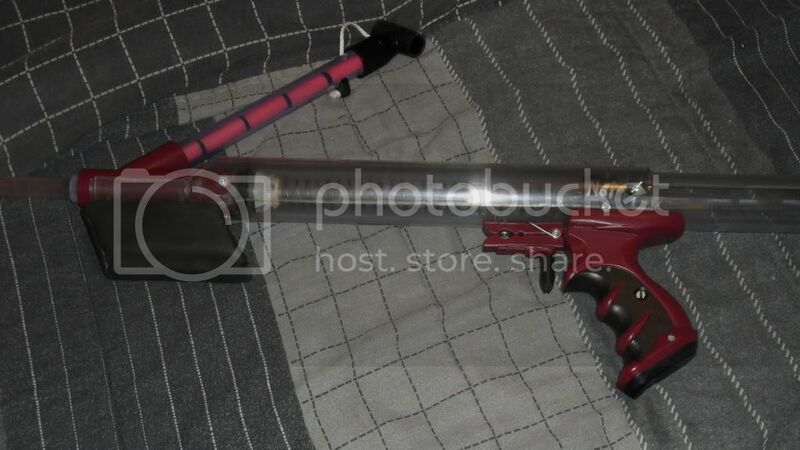 This is the only pic I have of the finished RevShot. A little changed. I stuck with the handle but redid it a little. 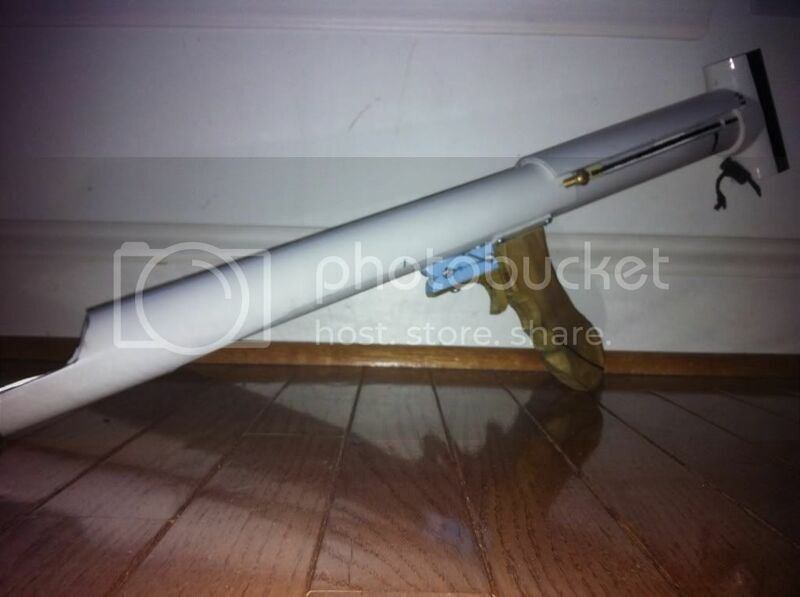 Replaced the stock, and made the wood curve around the PVC so it actually stays in place even without screws. Testing platform. Chrono's in the mail, data on Monday. Edited by Daniel Beaver, 04 November 2011 - 02:50 PM. It's a Reverse SNAP, basically similar to Carbon's SNAP 4. Just a rough prototype for now, but a friend of mine was really eager to try this concept, so we whipped it up this afternoon. It's powered by ACE#49 springs (basically identical to k26s), and hits about 130fps on the chrono (80-90ish feet). There's a lot of dead space in this setup, but whatever. I was expecting this layout to be an ergonomic catastrophe, but I was pleasantly surprise at how easy it was to prime. The recoil is strange, but very controllable. Here's some internals. Nothing special on the right-side, just a standard SNAP. On the left side, you see the priming bolt which the grip pushes against. You also see another set of springs, which act as a cushion for the plunger bar - making this gun is 100% dry fire safe. It's hard to see, but there's a washer behind the main spring rest which acts as the secondary rest for the buffer springs. All mechanically fastened (I mean everything), 7 full inches of draw, curved connection angles for strength. ^^ Looks cool. Looking forward to the writeup. Here is the RBP Rev2. Still a couple things to work out, but I should have a few of these finally built soon. ^^ Also cool, and also looking forward to your writeup. A fourth-generation version of my SNAP2 design. Construction is now highly streamlined, to the point where I can build one of these in under an hour. Writeup. Edited by Daniel Beaver, 12 November 2011 - 08:44 PM. FUBAR Labs. Solving simple problems with machine tools since 2009. 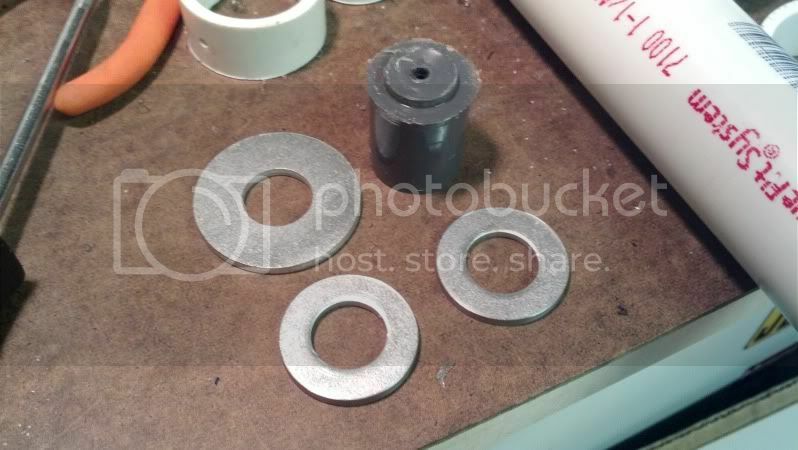 Langley: I recognize that those 5/8" ID washers are difficult to come by, some I'm developing an alternate method for making them which uses the standard 1/4" ID washers. I'm working on my new writeup right now, and should be done by tonight. Anyways, here's what I came to post: Baby SNAP. 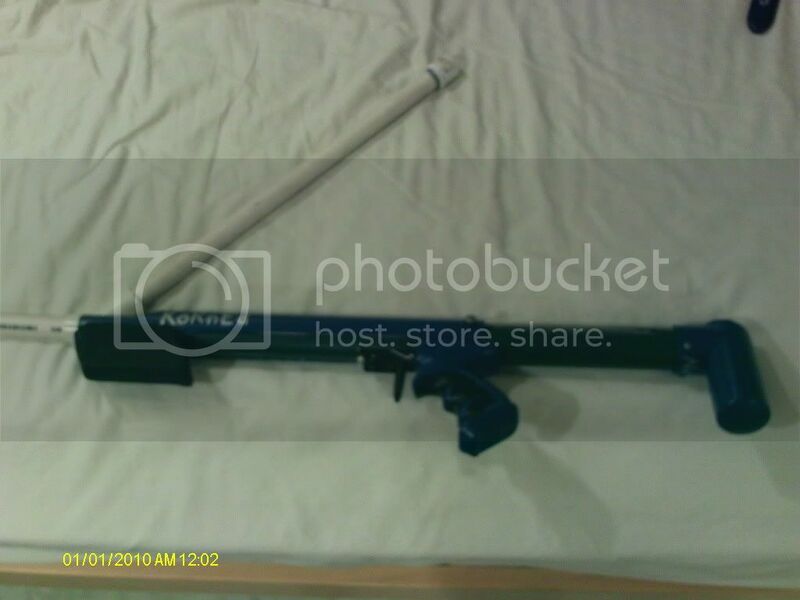 It's a shortened SNAPbow mk5, and uses a 3 inch spring with 1.5" of draw. It clocks in at about 120fps on the chrono, which is enough to give it ranges of 70-80ft. Gave me a lot of trouble to catch, but it works flawlessly now. I'm still waiting for the [k26] to arrive, but the blaster is finished. -Priming shroud is too long, and wobbly. needs some kind of guide. My hardware-store friendly OHPB: It works! Or at least... It worked. After a few shots the catch notch got worn down, and I decided I had already worked hard enough, so it'll be working perfectly soon enough. •Hardware-store friendly, not a single bit of polycarb.And although I used a [k25], any spring can be used. I even made a homemade washer out of gasket seal, and the wye is a homemade one I made a few months ago along with the homemade dart door. •You prime it with one hand. It's awesome. 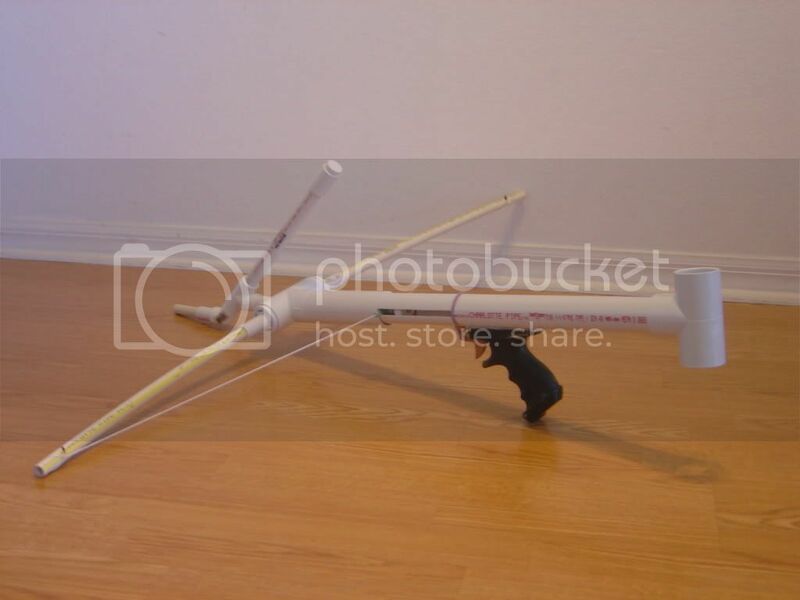 •The 2" plunger moves a massive amount of air. About 3 times as much as a Longshot, and about 1.3 times as much as the average SNAP. •Besides the fact that my catch notch got worn down, pipe ring catches are awesome. I'll definitely be using them more in future homemades. •Considering my homemade washer has a terribad seal compared what probably would have come from the skirt seal that Diamondback originally used, the ranges aren't that bad. I don't want to give official measurements yet though, since I haven't found a proper barrel length. •Fast primes. It's only slightly slower than a well-made pump action blaster. •The internals can be exposed by unscrewing 3 screws, and the blaster can be completely disassembled by unscrewing 2 more. •Can be used to bludgeon people to death in the event it stops working properly. •Solid despite only two screws hold the body together. •Comfy, and can be trimmed up during creation for pretty much any-sized person. •It's one-handed. You could theoretically dual-wield this. •Even with a measly 4-inch draw, this blaster is still massive. Increasing the draw would make it less ergonomically-friendly, and due to the priming nature of this blaster, that's a no-no. 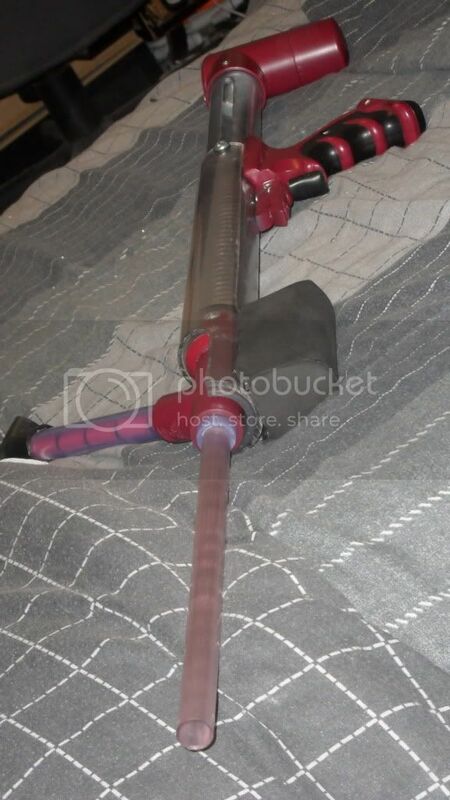 •I haven't found a proper barrel length yet, but I assume it's going to be long because of the plunger volume, which will make it the longest blaster I own. •Kind of heavy. Dual-wielding two of these would slow you down significantly, even though you would probably be the most menacing-looking person on the field. •Took about 4 hours total to make. Certainly that could be chopped in half with some practice, but it was still annoying. 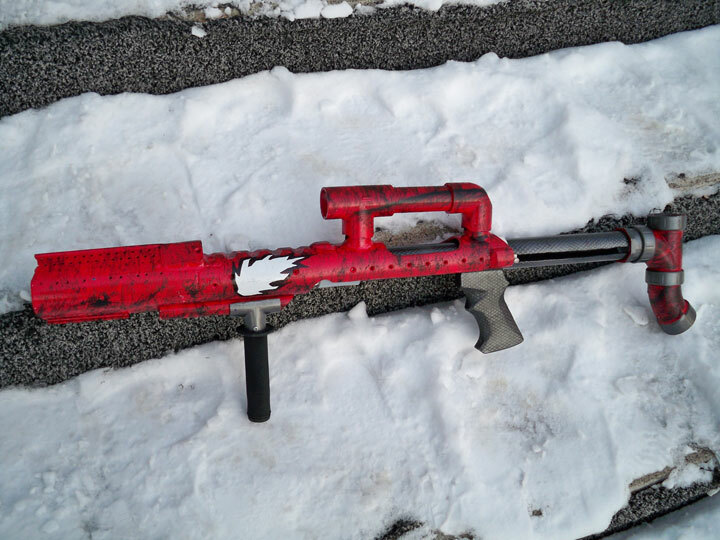 With fields that are being dominated by PumpSNAPs, RevShots, RBP's, etc, I found Diamondback's design to be quirky and fun when I first read it, so being able to make it a more accessible to those of us without scrollsaws was a very fun experience. Props to him, Beaver for the pump-action design that I used on this, and Razgriz for his version of the Pipe-Ring Catch. Edited by CuppaSteve, 22 November 2011 - 01:03 PM. Well, here is a rainbow I built for my friend Darkmatter. the whole thing (barrel-less, unprimed, stock-less) is only a hair over 17" from tip to tail. Probably my favorite thing I've built yet. My version of the JSPB Mad Ghost thing by 3DBBQ. Huge bike pump, therefore huge tank. The trigger is actually not the second check valve, but rather a combo of Mr. Badwrench's and the WNTS. It leaks all over the place, and holds enough air to fire for about 7 seconds. Two pumps merits about 80' flat. Three gets more, but I haven't checked. More than three and you risk busting the thing. It's very rickety, but it works, and that was my goal! 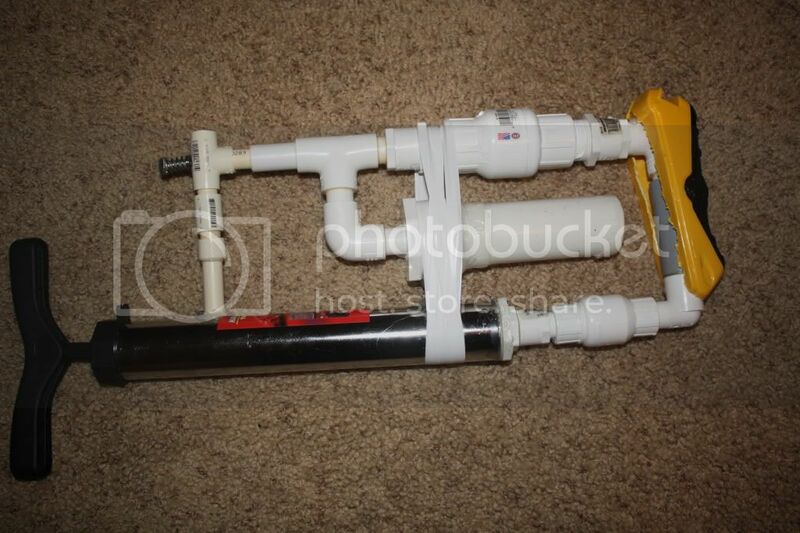 I made several of these blasters with 1" PVC telescoped into 1-1/4" PVC. 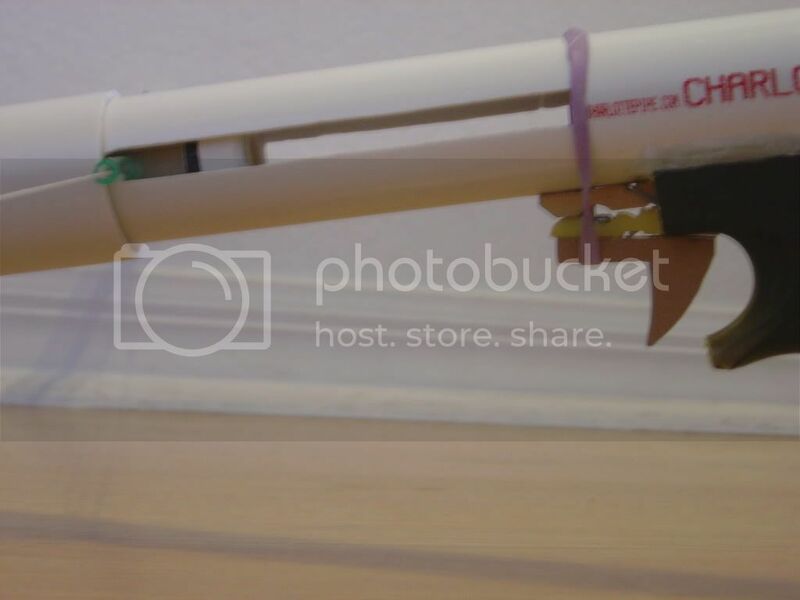 The front of the plunger tube pushes back against the plunger head, similar to how longshots work. 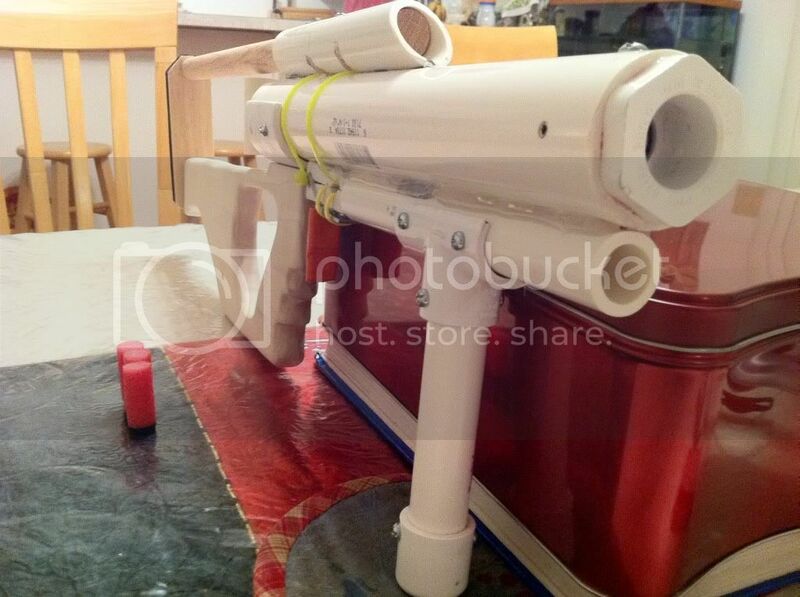 Test video, showing the priming motion of the last blaster. Edited by Daniel Beaver, 25 November 2011 - 08:54 PM. Pumpsnap with a 7" draw and a string stop. 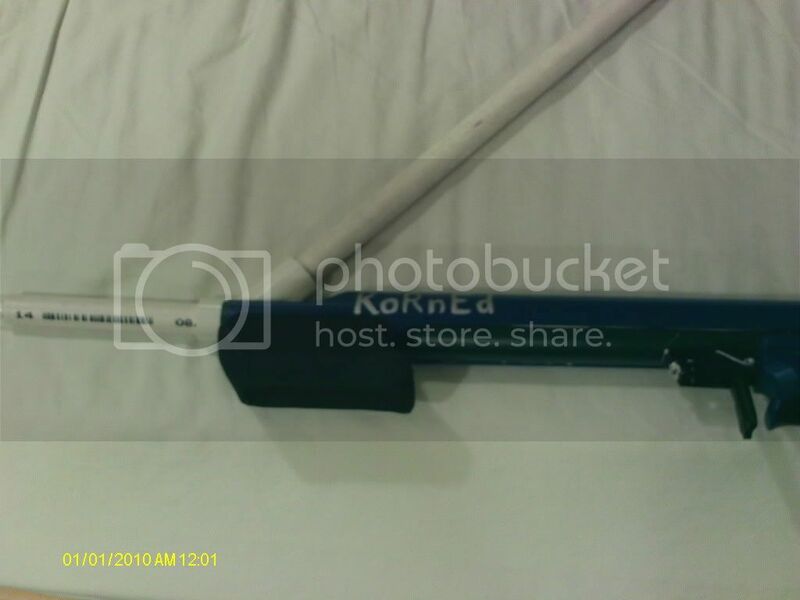 My first polycarbonate homemade, a tradtional +bow. Wood handles>Polycarb handles. After seeing carbon's 7.5 pump crossbow I was greatly inspired.I then decided I wanted one and got to work. Finished my first +Bow. A few extra holes but it works great. 3/8" side plates are going to make this thing hard to break. 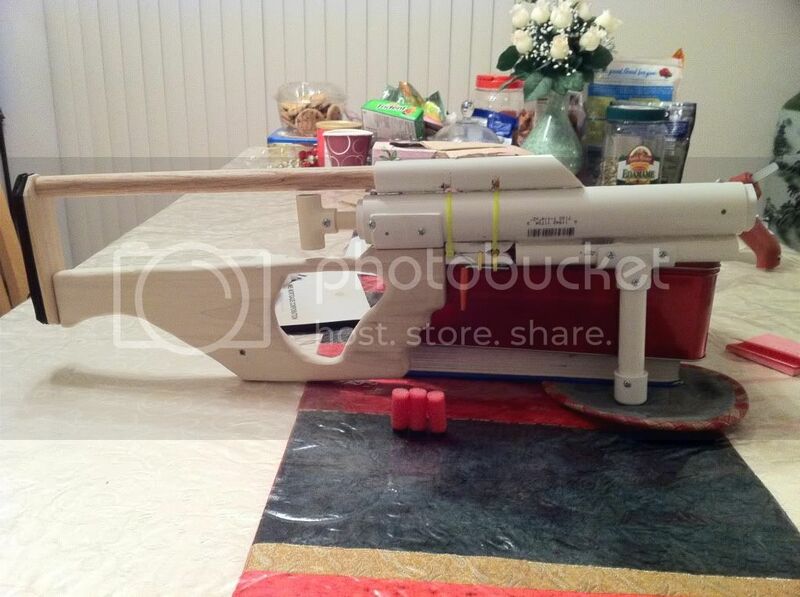 My old pumpsnap got a sanding and a new slide, plus new wood furniture. This is how I ended up doing the last two pumpsnap commissions I had. I must have ravaged my own slide with no breaking or wear in the wood. The handles are ladder sanded to 40 grit, and are comfortable as hell. Hongfui's Pumpsnap. He didn't want it painted. Shoots crazy hard. 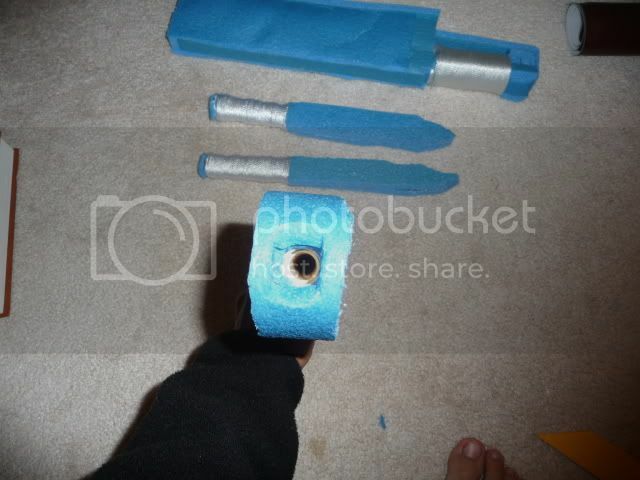 Made another +Bow for someone, but he requested that It be taken apart when shipped, so I never fully assembled it. This is the only picture I took of it. Sorry for the blurriness. Finished a shortened pumpsnap commissions for someone on NRev. Clear hopper, 12" Barrel, Normal CPT rather than a sliding trigger. Foregrip instead of just a sleeve makes it comfortable to prime. Boltsniper style grip with a twist for added comfort and stability. Spring hits full compression. Seal is perfect. This thing is awesome, and a ton of fun to play with. 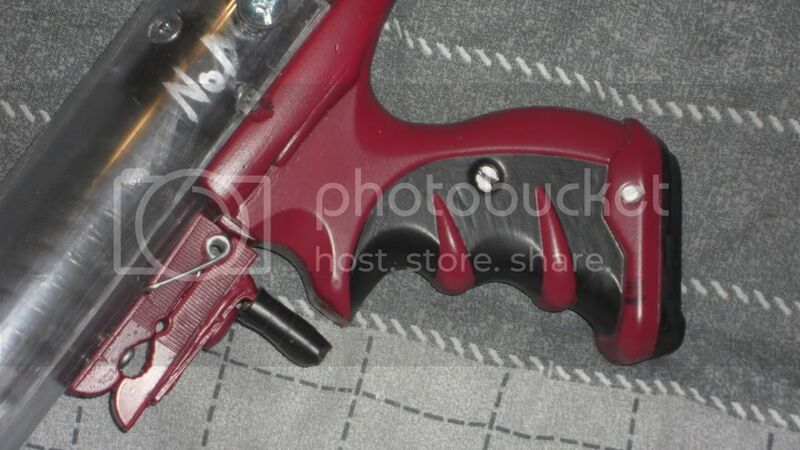 Close up of the trigger. Almost everything is mechanically fastened, except where the handle meets the "handle coupler." However that handle is still rock solid. Edited by andtheherois, 09 December 2011 - 03:22 AM. 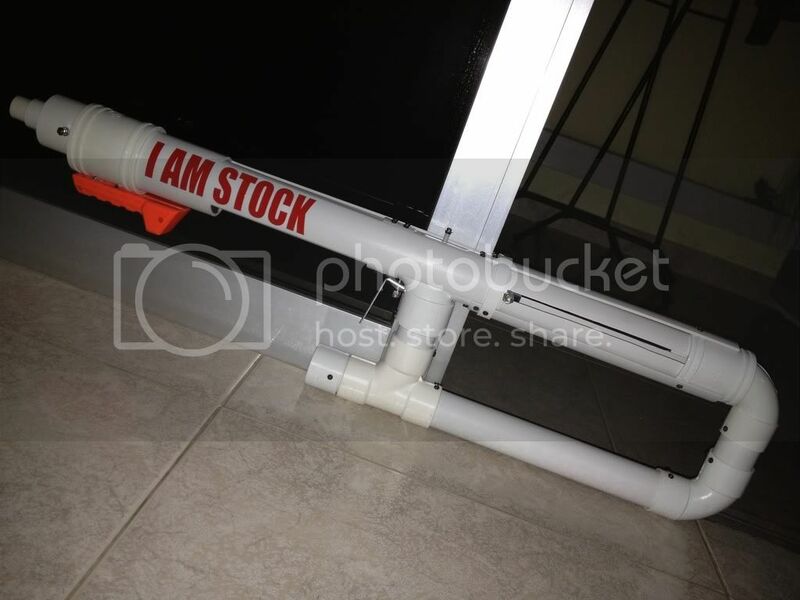 - 40mm plunger tube, 6inch draw. - Delrin rod, sleeved in Europet PETG with a "slot" for the catch. - Internalised and closed Ring Catch design. 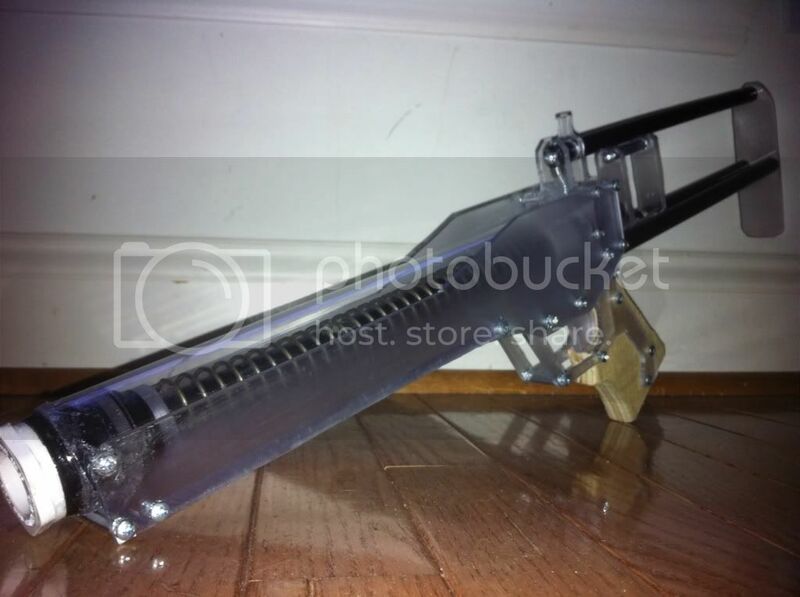 - Holds a full-length [k26] spring with 2 x stock Recon springs sleeved over. 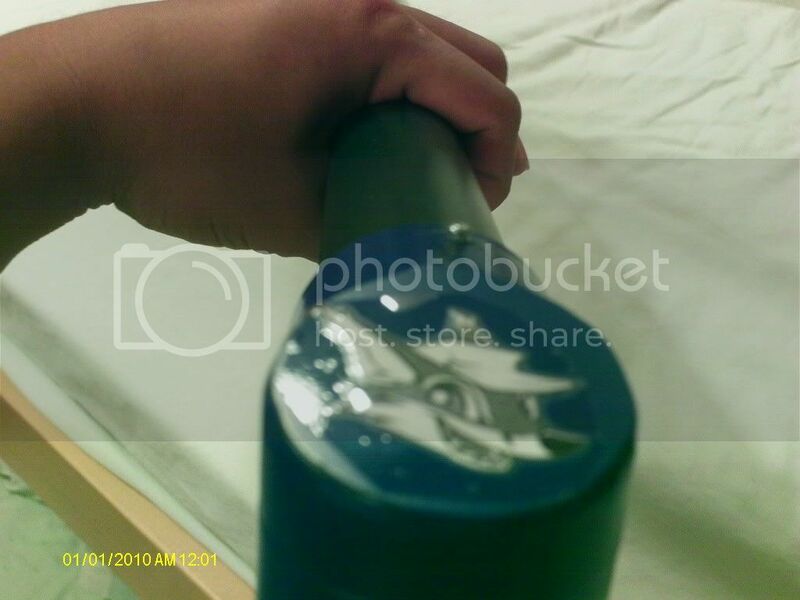 Hits about 80+ feet, because the plunger head doesn't give me a perfect seal. Finished my first pumpbow. Took a few days between school and social obligations, but it works. Considering I only had pictures to go on, I'd say I was pretty successful. The next one should turn out a lot better now that I know what I need to do instead of randomly cutting and pasting. Makes the stock 115% more sturdy. So after my personal-use Snapbow broke at DCNF2 (after serving me through most of the day, very well) bcak in September, I've been meaning to build another one. I originally intended it to just be a standard snapbow, but, along the way, I, well, decided to give it some smexy upgrades. 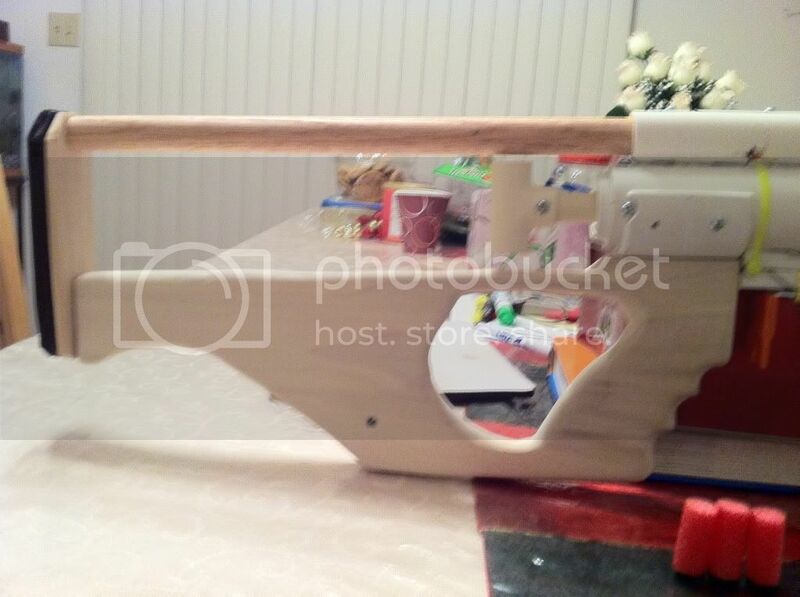 She's rocking a custom cut poplar wood thumb-hole stock (thanks to Langley and Andtheherois for inspiration for the stock design), completely sanded, rounded, and smoothed with 320 grit sandpaper. This thing is amazing to hold. The snap also has a 1/2" PVC foregrip, as well as a very smooth trigger. 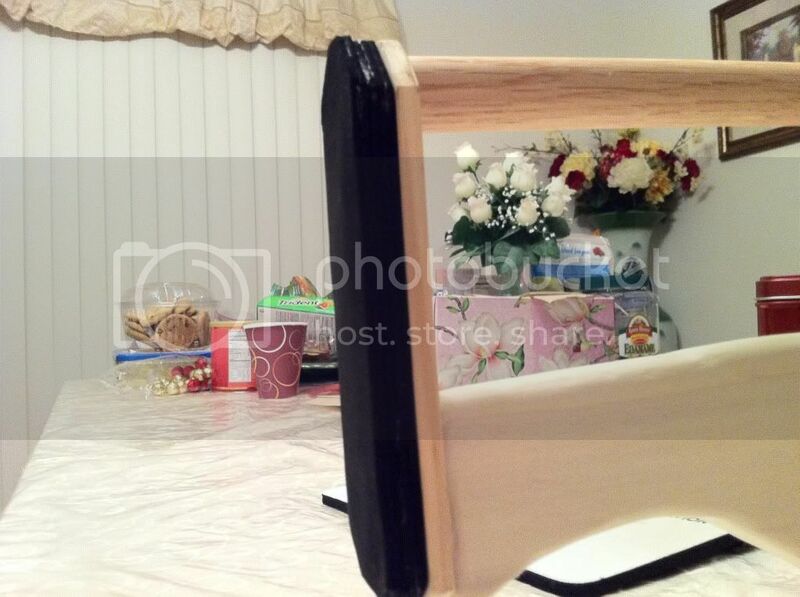 The board at the back of the stock is 1/4" thick wood, I believe it's poplar as well. The stock rod at the top is 3/4" oak dowel. 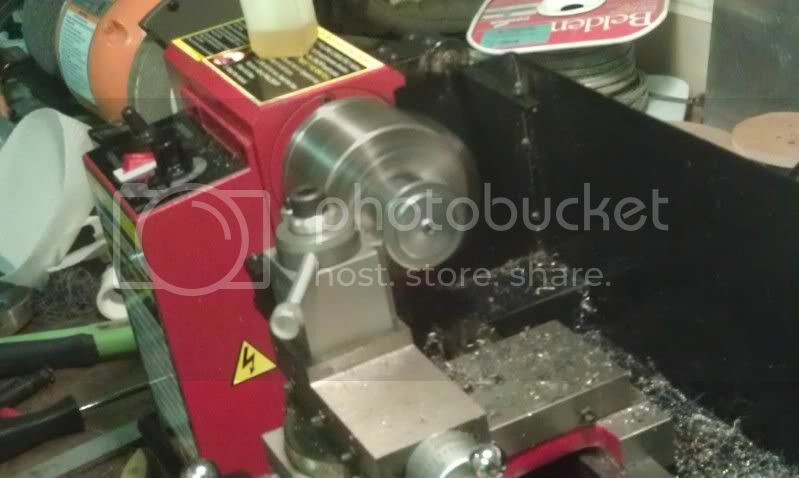 Bushing is a 1" x 1/2" hex bushing, pretty standard. Standard superlative plunger head seal. This beast is seriously awesome to shoot. 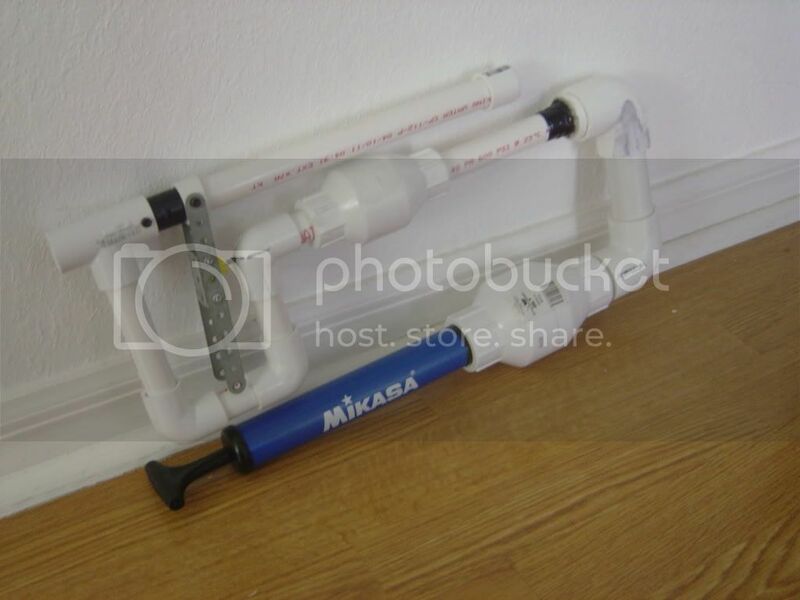 It uses a 12" plunger tube, and has a little over 6 inches of draw, making it very wieldy while maintaining a nice amount of power. I really like it, and I anticipate it being (one of) my primaries for a while. 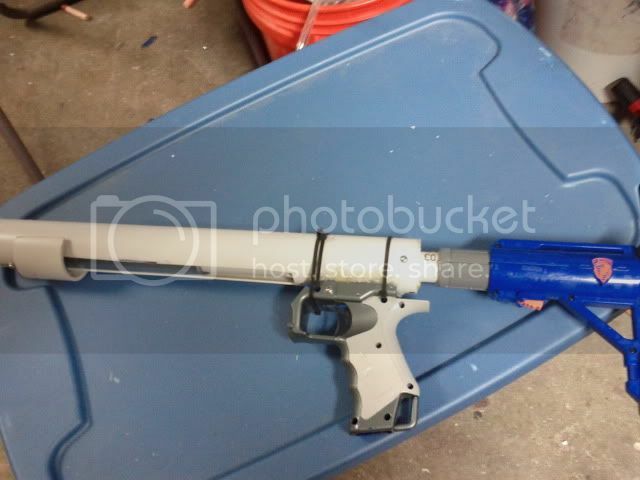 Everything on this is completely mechanically fastened, with the exception of the foregrip (PVC pipe) to plunger tube connection, which is glued with large amounts of high-temp hot glue, simply beause putting screws there would be ruinous. Haven't made any blasters in a while, and I needed a primary for an upcoming war, so I threw together one of Beaver's pumpsnaps. I had one minor improvement from the original. Instead of using a threaded bolt as the priming bolt, I found this. It's smooth where it runs along the slot, unlike a fully threaded bolt, but it's threaded at the end, so you can put a nut at the end to hold it in place. Also, I did a minor improvement to handles from nerf shells. Not sure if this is useful or not, but I filled the handle with epoxy putty, then cut a polycarb piece the same size as the top on the handle, then solvent welded and screwed it into the epoxy putty. Then I screwed the coupler into the polycarb piece.